Hi India, thanks for agreeing to chat with me. Can you tell us a bit about your background? India: I am a self-taught artist. I drew when I was little, but never seriously and usually purely out of boredom. So I “began” art when I was fifteen, and learned by watching speed painting videos. In the beginning, I think I did more of that than any actual drawing. I would just absorb as much information as I could then try to do it myself. I like to think that, at least for me, art is imagination and insanity wrapped into a nice little bundle of mild obsession. And by mild obsession I mean six hours a day quickly escalating to eighteen hours a day of nothing but art. And here we are today. Wow! Eighteen hours is a lot! How do you keep up momentum like that? India: A lot of tea and coffee, but I mostly just love what I do! India: I didn’t want to be an artist, actually. I wanted to be an archaeologist. In fact, I remember being little and telling my mother that I was not going to be an artist – as I sat in my makeshift shop selling toddler scribbles to her. But I instantly knew that I was going to be an artist when I came across my first speed painting video. I saw what was possible with art, and I started teaching myself immediately after. I still love the idea of archaeology, but an artist is who I am; I can always learn other fields on the side. So I guess working on art for a game about ancient history and myth is right up your alley then? India: Yes, it’s been fantastic to work on! I love any excuse to learn about other cultures and their mythology! 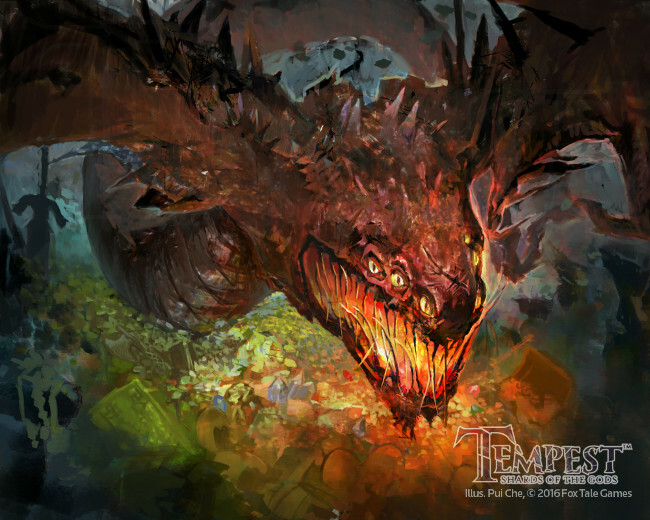 I have to ask the self-aggrandising question… What is your favourite piece of art in Tempest? India: Definitely “Dragon of Earnanaess” by Pui Che! The colors are gorgeous. It’s one of my favourites too. Pui is doing a lot of colour-filled pieces for us. Can you tell us a bit about your inspirations? Who, or even what? India: Currently, my biggest inspirations are Ruan Jia, Wei Feng, Wojtek Fus, Ahmed Aldoori and Noah Bradley. In terms of “what,” I’d like to take a moment to give credit to the many walls I’m often left staring at with nothing to do but think. Haha, many is the artist who has been inspired by a blank canvas. What is your favourite piece of art? India: “Rondo of Moon” by Ruan Jia. I love the use of color and lighting and how the whole image feels delicate and almost as though the paint is still wet, regardless of it being digital. It really does. Ruan Jia does a lot of really great work in that border between digital and traditional. Can you take us through your own process, from start to finish? How do you work? India: With blobs and scribbles mostly, for hours. Also sitting in probably some of the worst positions possible while blasting music and getting scared by the occasional passing fly. I don’t have one singular method for painting either, it really just depends on what needs to be done. If I have a clear image of what I’m working on, I may go straight to color, either with a sketch or just blobs. If I need something more refined and easily changed, I will color over a black and white rendering, which allows me to change colors as needed. What tools do you find the most invaluable? India: I mainly use digital media, being purely Photoshop CS6. Although I can do similar work with traditional mediums such as oil paint, I find Photoshop to be a lot more forgiving. On top of that, it would only take me a few hours to do what may take days or weeks traditionally. I also have the liquefy tool – maybe it’s a tad lazy, but it is an amazing tool for quick adjustments to those slightly lopsided eyes that happen far more often than they should. For concept work on personal projects, I like to use a sketchbook so I don’t have to search through thousands of image files to find my references. There are advantages to both mediums though. You mentioned previously that you have a different process when you are working on your Daeva images than your normal process. And you have done some really stunning pieces for Daeva. What do you do differently in your process? India: That also depends! I often use Daeva as a way to study and practice different things. I’m forced to really think outside of my normal visual library when developing the different worlds within Daeva, and I screw up on it more often than not. That being said, the method that I mentioned earlier (coloring over a black and white rendering), is what I have developed from all of that experimentation. The dramatic lighting is added after the coloring using a color dodge layer and a multiply layer. For the panels themselves, I stick with going straight to color, especially since the lighting in each of them is roughly the same throughout all of Chapter One. The only problem with the other method is that it can be hard to keep consistent across similar images. That sounds like a really unique way of painting. It’s almost like using clear inks or something. India: Yes it is similar to washes or glazing with paints. I have a couple of process videos that display this approach! How much research would you do before starting on a piece? India: If I am working on personal work outside of Daeva, usually none. For professional images, it all depends on what is given to me and my prior knowledge on the subject. Some images require a lot more research than others, especially when mythology is involved! Yeah, there are so many conflicting versions of every myth that it can be hard to narrow down to a single unified thread of truth. Even historical “truth” is hard to pin down. India: I’ve found that the historical artwork for the majority of mythology can often tell you more visually than many written articles will provide. They were made to tell stories in a time when the vast majority of people couldn’t read or write! That makes a lot of sense. For something like Daeva, you have obviously done a lot of research into some interesting mythologies. Can you tell us something of what inspired your graphic novel? India: Ah, the research for Daeva… I have a very large stack of papers covered in notes on mythology and culture from all around the world. In each of the three worlds, you can find different real world cultures blended together. Although many names of locations and characters are in Latin, I have designated each world into a historical “section”. Gehenna is based off a mix of East and South Asia, as well as a little of my own designs. Gaia (which I’ve been spelling wrong for quite some time), is based off of thirteenth century Europe, although its monsters range from global lore. Caelum pulls from southern areas such as Greece, Egypt and North Africa. It goes a little farther than purely aesthetics though, each world also takes bits and pieces from various religions and customs to form a new culture all together. It was originally supposed to be a manga. At the time I didn’t know that I could just do whatever I wanted, now I do! What has it been like working on a storyboarded project like Daeva, as opposed to pure illustrations? India: It’s… odd. I struggled a lot with it in the beginning trying to force it to be a manga. When I decided not to go that route it became much easier. I have to simplify quite a bit and make sure colors, items and scenery are consistent throughout each sequence. I also have to think about my own time – I don’t have much allocated to Daeva, so when I work on it, I want to get multiple panels done at once. I also get to draw some fun expressions and poses, something I would normally don’t get to do! Do you think there are any trends in digital art (or art in general) at the moment? India: I think there are multiple trends at the moment. There are a lot of interesting shifts coming into the illustration world. A couple of years ago it was the trend to have very “digital” looking images, and now we are going back and emulating the traditional look. I am really excited for this! By “digital” looking, do you mean concept-arty work like that on a game like Guild Wars 2? Lots of sharp corners and washes? India: I actually think that the work for Guild Wars 2 has a fantastic blend of digital and traditional looks! Some of the images take on aspects of watercolor and others look like they could easily be oil paintings with their softer, lost edges. (I’m looking at you, Ruan Jia!) In my opinion, really “digital-looking” work has a lot of hard edges and high saturation, which I am guilty of myself! There is one trend that worries me. I’ve run across an alarming number of rising artists asking what sort of fan art or “fan service” they should be drawing to get popular, and even stating that it isn’t what they would prefer to do but they feel they need to. Some artists do this type of work because they truly do enjoy it, but those are not the ones I’m talking about. I believe it’s important for artists to create work simply for the joy of the work, not the joy of having a large following. I think the two can be easily confused. There seems to be this notion that to be considered a good artist, you have to be internet famous and fast! Like right now! I wish there was a way to let every new artist know that it takes time, and that your amount of followers doesn’t dictate your worth. Paint like no-one is watching, huh? What is the best piece of advice you have ever been given? And if you could offer some advice to younger you, just starting out, what would it be? Some of the best advice that I have come across would be to not be afraid of mistakes. Mistakes are going to happen, they just are, but if you are working on a painting and constantly worrying about if that arm is too long or “What if the color doesn’t come out right?” then you are going to take the joy out of painting. You’re going to work yourself up to the point that you just stop and don’t want to share your work because you’re afraid of others seeing the mistakes. I’ve seen it a lot in newer artists; I’m guilty of it myself. I think the best thing to do for handling mistakes is to let it happen for the time being, then yes, go and get a second opinion. See what’s wrong, what you can change, and how you can improve, even if it’s irritating. Then go back, fix it and learn from it. That way, the next time you are working, you can keep that small lesson in mind and learn from the mistakes rather than let them crush you. Can you give us any examples of mistakes you used to make, and don’t anymore? India: Rainbows. I once had to paint a rainbow. It turned into many grotesque rainbow wannabe’s. I now find myself with a perpetual loathing for rainbows, hence it not being on the list of my commonly made mistakes. Another thing I would have to add is to get some sleep and take breaks. I’m a bit of a hypocrite on this one, as I haven’t really slept in weeks and I hardly take breaks. In a way, I guess I’ve accidently trained myself to be an insomniac by forcing myself to stay awake each night to get more work done. It’s a little counterproductive though as it causes you to burn out quickly and then you can’t get any work done at all. So take breaks and get some sleep! Good advice for anyone. Even though I’m right there with you. It’s easy to say “get lots of sleep”, but it’s so much harder to make yourself do it! Well, thank you so much for your time. India: Thanks for having me! India: Up next is another blank canvas in Photoshop. That’s it for our chat with India. Thanks for reading. We hope to do a few more of these in coming months, so if there are any questions you’d like to know of our artists, feel free to suggest them to us!